While Denny battles demons of his own and Cookie and Clancy disappear, a pregnant Fina Fitzgibbons investigates the death of her friend’s husband and in doing so lands in the middle of a group of art and drug traffickers. For once I can say I have read the majority of a series. 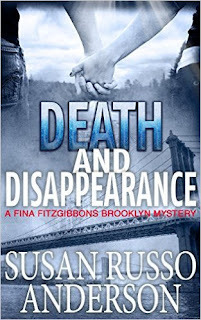 I've read all but the 3rd installment, (Whiskey's Gone) in the Fina Fitzgibbons Mysteries and written reviews of two (#2 Brooklyn Drop) and Death of a Brooklyn Landlord (which is in the Lorraine McDuffy Mysteries). For those who may be new to the series, Lorraine is Fina's mother-in-law, since Fina and Denny finally tied the knot. Well, truth be told, they've done a little more than tie the knot because at the outside of D&D, Fina is 3 months pregnant! Denny doesn't seem to notice or care much though, about the pregnancy, about well...just about anything, since his father died. Part of me would like to be sympathetic because everyone grieves in his or her own way. The other part of me would like to give Denny a (gentle) slap upside the head and tell him to snap out of it! His family and his co-workers have been making concessions and excuses for him for since his father's death. For one, at least he had a close relationship with his father; for two, how would his father feel about Denny's current lack of action? One of those helps from his co-worker was giving Fina's detective agency a homicide case to work on, where the victim turns out to be the husband of one of Fina's old friends (Lake - an artist). Then Lake's apartment is cleared out (even the dust bunnies have been moved out) and Fina worries that Lake has also become a victim of the person or people who had her husband Steven killed. It turns out the art world has egos every bit as big and all the cattiness and backstabbing of the entertainment business. But with artworks being shipped from one place to another, or imported/exported, there are additional opportunities for people to engage in *ahem* less than legal smuggling-type activities. If you are looking for a good mystery-thriller series, you won't go wrong with the stories of Fina Fitzgibbons by Susan Russo Anderson! 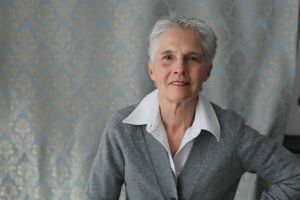 Susan Russo Anderson is a writer, a mother, a member of Sisters in Crime, a graduate of Marquette University, and a life member of The Art Students League of New York. She has taught language arts and creative writing, worked for a publisher, an airline, an opera company. Like Faulkner’s Dilsey, she’s seen the best and the worst, the first and the last. Through it all, and to understand it somewhat, she writes. TOO QUIET IN BROOKLYN, the first in the Fina Fitzgibbons Brooklyn mystery series published December 2013. The second book in the series,MISSING BRANDY, published September 2014, and WHISKEY’S GONE published in January 2015 and completes a trilogy. The fourth book in Fina’s series, THE BROOKLYN DROP, published August 2015. DEATH OF A SERPENT, the first in the Serafina Florio series, published January 2012. It began as a painting of the Lower East Side, the landmark immigrant neighborhood in Manhattan, and wound up as a mystery story set in nineteenth-century Sicily. NO MORE BROTHERS, a novella, published May 2012, the second in the series. The third book, DEATH IN BAGHERIA, published in December, followed by MURDER ON THE RUE CASSETTE in January 2014. Click on the banner to go to the tour page, where you will find links to more reviews, as well as a guest post, a character guest post and an interview! You can also find out how to become a blog host for future book tours while you are there!